I’ve been a bit quiet on the blog and social media front lately as, to put it simply, I was just having too much fun over the holidays. Relaxing, playing board games, eating way too many pigs in blankets and chocolate Roses, and enjoying some time just switching off. Seeing as we pretty much skipped Christmas last year as we were travelling around India, I wanted to make the most of this one with my family and friends, and the last couple of weeks couldn’t have been better if they’d tried! Wherever you were in the world, I hope you all had a fantastic Christmas and New Year too! But now it’s back to the daily slog of setting the alarm painfully early and dragging myself into work, actually eating at home instead of out all the time, taking down the festive decorations and putting away the Christmas jumpers (boooooo!) and all the usual mundane routines of life. Depressing just doesn’t cut it. I can’t complain too much though as I do have some extremely exciting things to look forward to in the next couple of months including the BB Bakery’s Afternoon Tea Bus Tour around London, seeing Andrew Lloyd-Webber’s Cats the Musical which I absolutely adored as a child, and my birthday later this month, although I’m not as excited about this as I usually am – I must be getting old! We also have two trips coming up to keep us going through the January blues – Cuba in February which I’ve already raved plenty about, but my excitable ramblings are much deserved as we haven’t been on a relaxing beach holiday in ages. We’ve also snuck in a little trip over Easter as we always try to go to a different European destination every Easter holiday weekend. This year we’ll be heading to Italy and visiting the gorgeous cities of Florence and Pisa and then taking in the postcard perfect villages of Cinque Terre. With so much to look forward to, I keep getting side tracked in my own little bubble of excitement, but I do want to share with you some of the great gifts I got over Christmas that I know you’ll love too (and may even want to put on next Christmas’s wish list!). 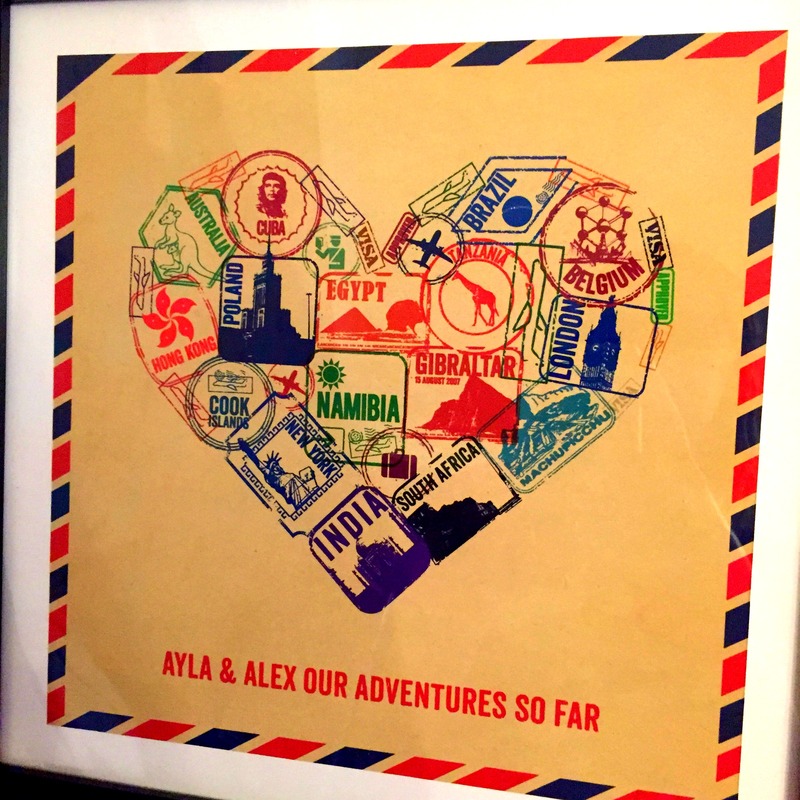 I fell in love with this gorgeous personalised passport stamp print* as soon as I saw it on The Cosy Traveller’s ridiculously long Christmas gift idea list. This was something that I desperately wanted needed to hang on my wall. Rather than just buying myself a Christmas gift, my mum offered to get it for us, of course with me hinting at our favourite places for the stamps. I haven’t quite decided where to hang it up at home yet but it will definitely be on show where everyone can see it. *If you’ve spotted the Cuba stamp on the print…no we haven’t been yet, I can just tell it’s going to be a fantastic trip. Yes, this is how excited I am for Cuba! 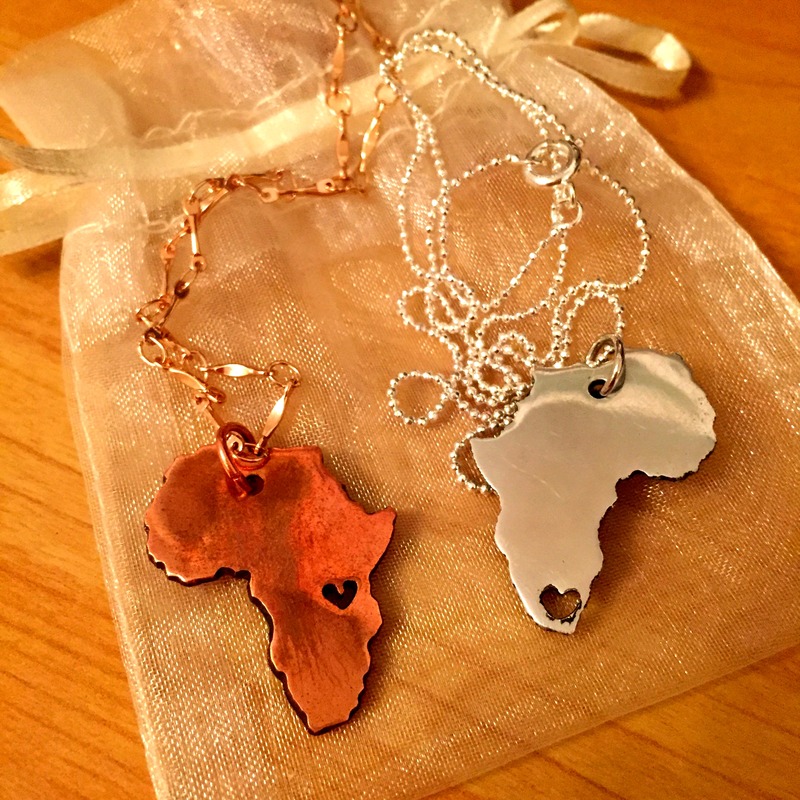 I have been searching everywhere for a map of Africa pendant but I just couldn’t find the exact one I wanted. So I almost shouted out with glee when I finally found one I loved on Etsy. I was able to personalise the pendant by having different finishes, choosing which African country to have the cut out heart over and getting a longer length chain. I wear it all the time so now Africa is even closer to my heart than it was before. As I’m sure any traveller would agree, you collect so much stuff on your travels that I have a huge amount of souvenirs, postcards, photos and just a huge collection of odd bits of bobs that I’ve picked up from all over the world. 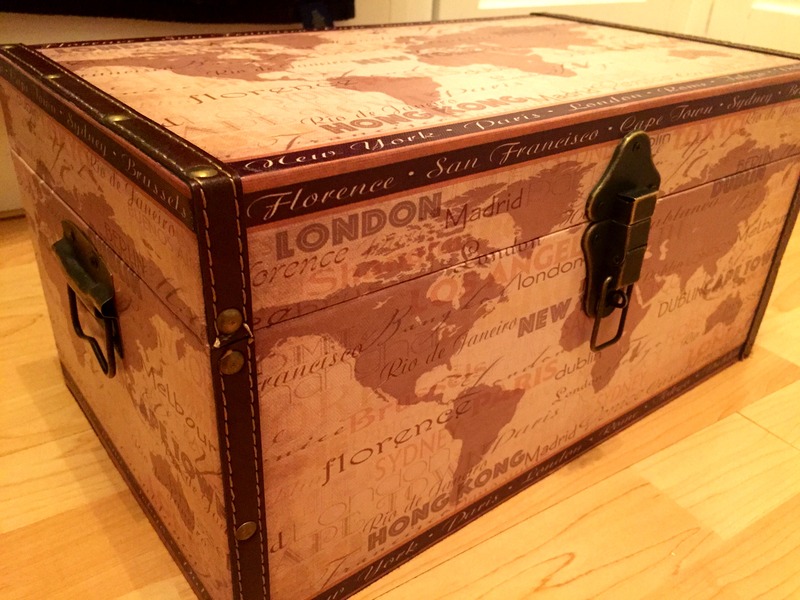 Mr Ayla bought me this beautiful trunk, decorated with a world map, to keep all my travel collections in. It totally looks like a treasure chest so is the perfect place to store all my treasured memories from our travels. Since our trip to India last year my wardrobe has been gradually filling up with more and more pashminas. 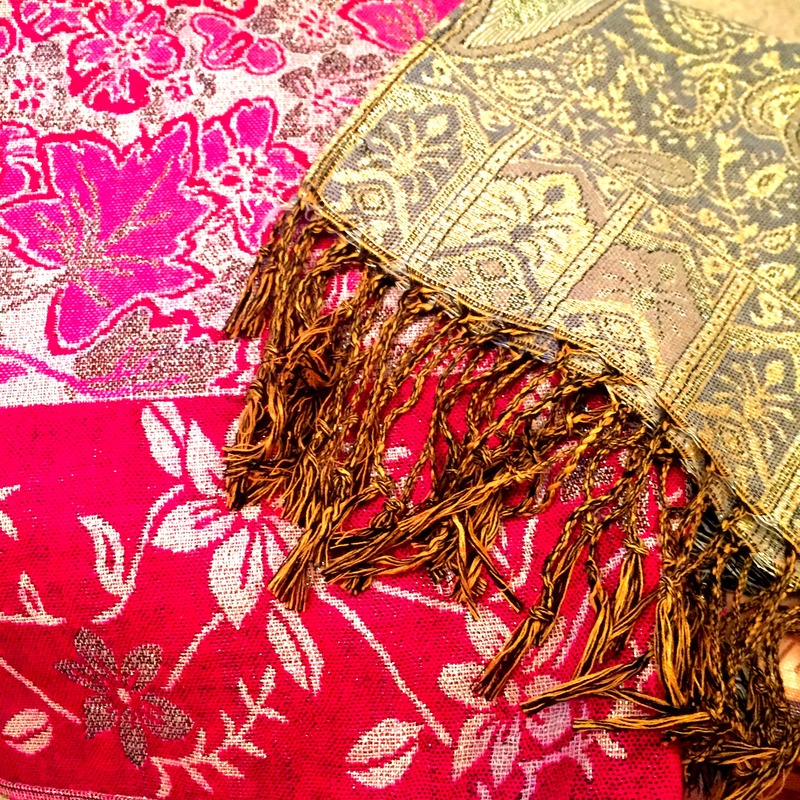 The bright colours, striking patterns and silky soft material of those I bought in India have given me a slight addiction and so these two new pashminas will go very nicely with my current collection. While this might not have anything to do with travel I thought it was just too beautiful not to mention. 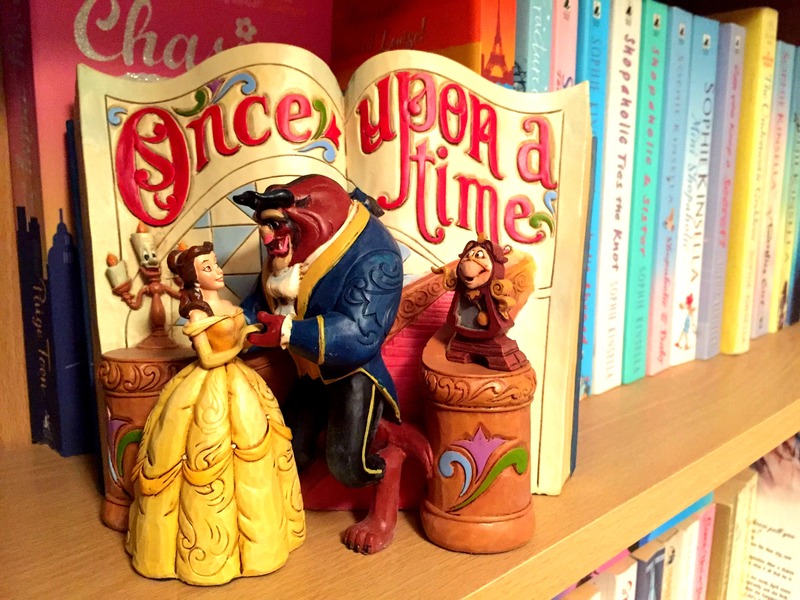 I’m sure it’s no surprise to anyone that I’m a huge bookworm and a huge lover of anything Disney/animation/big-kid-ish so this ornament with a “Once upon a time…” book as a backdrop couldn’t be better suited for me. I ooh-ed and aah-ed at it every time I passed it in the shop window so I love the husband even more for actually taking note and remembering this! I hope you all got spoilt rotten over the holidays too, and have a fabulous 2015 planned ahead of you! happy new year! keep on blogging! Haha sisters from another mister! 😉 Would be so much fun to meet up in another country! Book it book it!! Damn straight! I want one! I love it! It looks so good but it was really hard to narrow it down to our favourite 15 places though! Glad to hear you had such a good Christmas! There’s nothing like being at home with family 🙂 Love all of your travel pressies too, especially the stamp print and the Africa necklace. Not long until Cuba now – bet the countdown has begun!